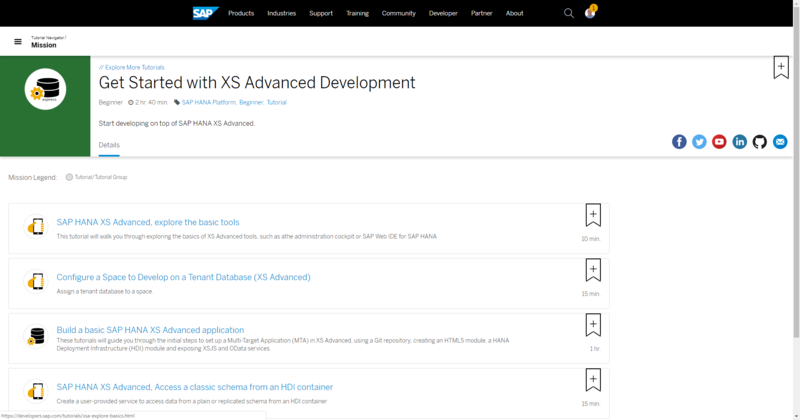 By now you’ve probably discovered that the SAP Developer tutorials have gotten a makeover. Tutorial Navigator: Improved navigation, including free-text search and filters in a single tool to find the content you want. Missions: Organized collections of tutorials — which can be performed in 2-3 hours — to let you get to know key SAP technologies. The tutorial navigator now lets you access, in one place all available tutorials, groups and the new tutorial missions (more on missions later). And let’s you more easily search by product area and level, or simply by free-text search. Here. 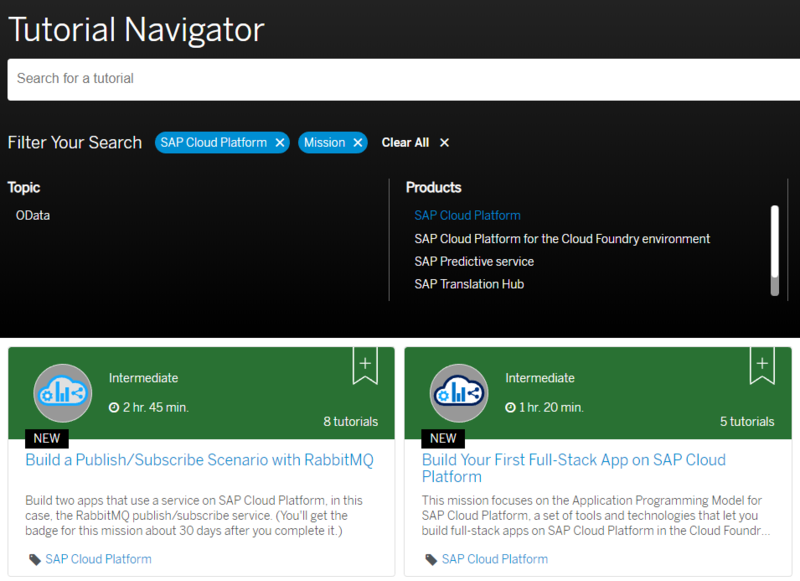 I’m displaying all the missions for SAP Cloud Platform (click here to get all the current missions). On each tile you can see the title, description, time to complete the tutorial(s), and the expertise level. For missions and groups, it will show you how many tutorials are included. One of the key changes is the addition of missions. Missions are high-level learning goals, like “Get Started with SAP UI Development” or “Build Your First Full-Stack App on SAP Cloud Platform“. The mission has an ordered list of tutorials and tutorial groups, and most missions award you badges for completion. Missions that award you a badge have an icon with a gray background. The icon is based on the regular icon for the topic/product, with a unique color to identify the mission. For example, the following is the icon for the “Build Your First Full-Stack App on SAP Cloud Platform” mission, one of the 7 new SAP Cloud Platform missions. The icon is the same icon as the badge you will receive when completing the mission. We’re writing new missions for all the major SAP technologies. 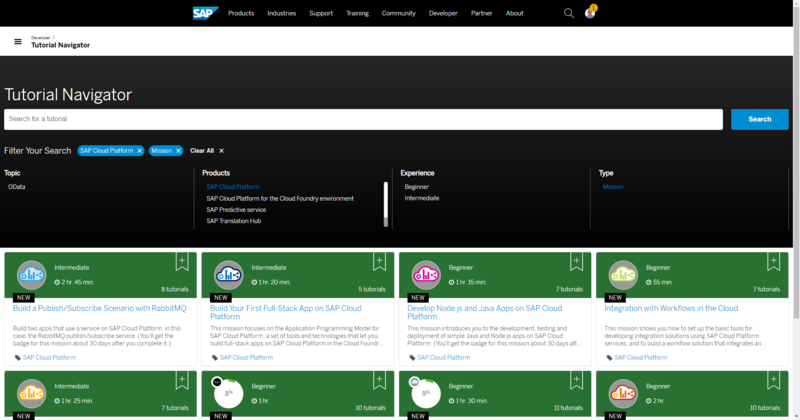 We’ve started with a series for SAP Cloud Platform developers, and we’ll be adding more in the months to come. In the coming weeks, I’ll provide some navigation tips, suggestions on how to navigate around the tutorials, and a look at some of the new content. Subscribe to my blogs to keep up to date on the latest about tutorials. Awesome to hear about all these tutorial missions, Daniel! Remember to REGISTER and join Daniel this coming Tuesday October 9 for a special SAP Community Call to learn more about these new tutorial missions as well as Developer resources to keep learning. Nice, time to earn some badges!